The pineapple crochet stitch is a vintage stitch pattern, not to be confused with pineapple lace, that uses a unique combination of single crochet stitches and spaces to create a terrific densely-textured fabric. The stitch pattern is worked on the right side only, without turning the work, finishing off at the end of each row and starting over again at the beginning of the next row. This leaves a lot of ends to weave in unless you want fringe on each row, but it is a great stash buster. This stitch was originally published in the 1917 version of Fleisher's Knitting & Crocheting Manual Fifteenth Edition. Here are the original instructions, and below that, you'll find more detailed contemporary instructions. 1ST Row: Draw yarn through 4th stitch from hook, skip 1 chain, draw through next chain and draw through the 3 loops on hook; chain 1. *Draw loop through the same stitch as the last loop, skip 1 chain, draw through next chain, draw through the 3 loops on hook; chain 1. Repeat from * to end of row. Break off. 2D Row: Fasten yarn through a chain of 1st row; chain 4. Draw loop through 1st space, through 2d space, through the 3 loops on hook; chain 1. *Draw loop through space last used, through next space, through 3 loops on hook; chain 1. Repeat from * to end of row. Break off. 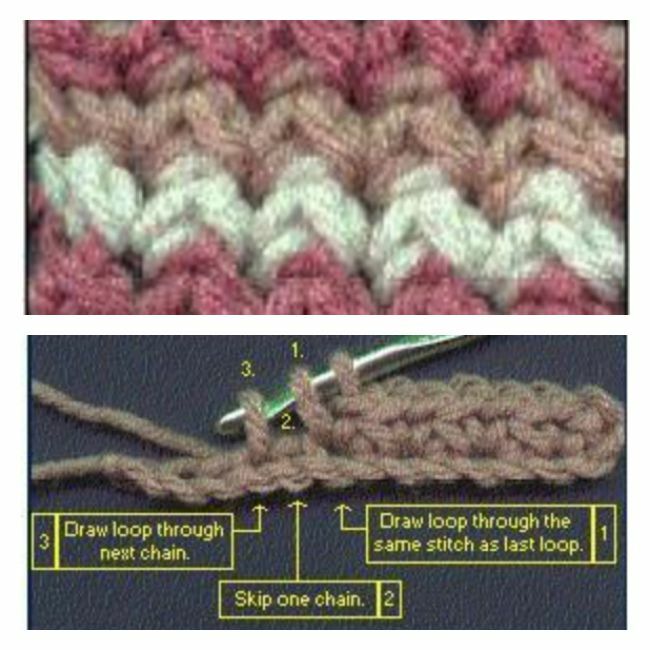 Sandi Marshall offers the following updated, detailed instructions for understanding this vintage crochet stitch. Decide in Advance if You Want Fringe: Because this stitch requires the fastening off of the yarn at the end of every row it works best for use in various sizes of Afghans, leaving a length for fringe at the beginning and at the end of each row. It's perfect for scrap yarn afghans made in many colors. Decide ahead of time what length you want your fringe to be and leave that approximate length at each end. You can trim uneven fringe ends to make them all the same length when afghan is finished. Note on Right Side / Wrong Side: When doing this stitch, the right side of the work will always be facing you. You do not turn but fasten off at the end of every row and attach the new strand at the beginning of the next row. That said, the "wrong side" of the fabric has an interesting texture and color pattern that is appealing once you have the finished product. Pineapple Stitch Instructions: Leave a length of yarn for fringe before your first chain loop. Make a chain of an even number (a multiple of 2). Row 1: Insert hook in the 4th chain from the hook, yarn over hook, draw yarn through the chain (leave this loop on the hook), skip 1 chain, * insert hook in next chain, yarn over hook, draw yarn through that chain (you should now have 3 loops on the hook), yarn over hook, draw through all 3 loops on the hook, chain 1. Repeat from * across the row. On the last stitch of the row, you will be drawing the 2nd loop through the last stitch of the previous row (then drawing a loop through all three loops on hook, chain 1). Fasten off, leaving a length of yarn for fringe. Row 2: Leaving a length of yarn for fringe, attach yarn in the first stitch of the previous row. Chain 4. Insert hook in the same stitch as where yarn was attached, yarn over hook, draw loop through this stitch, insert hook in next chain-1 space, yarn over hook, draw loop through this chain-1 space, yarn over hook, draw yarn through all three loops on hook. Chain 1. * Insert hook in same chain-1 space just used, yarn over hook, draw yarn through this chain-1 space, insert hook in next chain-1 space, yarn over hook, draw loop through this chain-1 space, yarn over hook, draw yarn through all three loops on hook. Chain 1. Repeat from * to end of row. On the last stitch of the row, you will be drawing the 2nd loop through the last stitch of the previous row (then drawing a loop through all three loops on hook, chain 1). Fasten off yarn, leaving a length for fringe. Repeat row 2: Repeat row 2 until the piece is the desired length. Finishing: Add additional fringe to the ends if you want the fringe to be thicker.